To be used with RusMap 1.8.1 and ProMods2.30. I'm happy to tell that the mod of Estonian-Russian border improvements is done to the point I can release the first BETA. Some months ago I have started the rebuilding of Estonian-Russian border near the Narva when I found that the current state of this area was way too old and unrealistic in PM version. I have been forced myself on creating a more-harder-to-cross border and giving that area it's uniqe feeling. Because I never have been there, and Russian border area don't have any Google SV images available I had to go through dozens of content to recreate it as rmuch as realistic as possible, even if some of the places are much more a fantasy. That's the result of my work by now. 1. Narva got a small rebuilt. I din't liked that PM Narva looked way too modern, more a like a new city from Finland rather than in the East of Estonia. Since I could not access SV the last time the city area past the river is more a fantasy land, but I still tried to make it more realistic. 2. 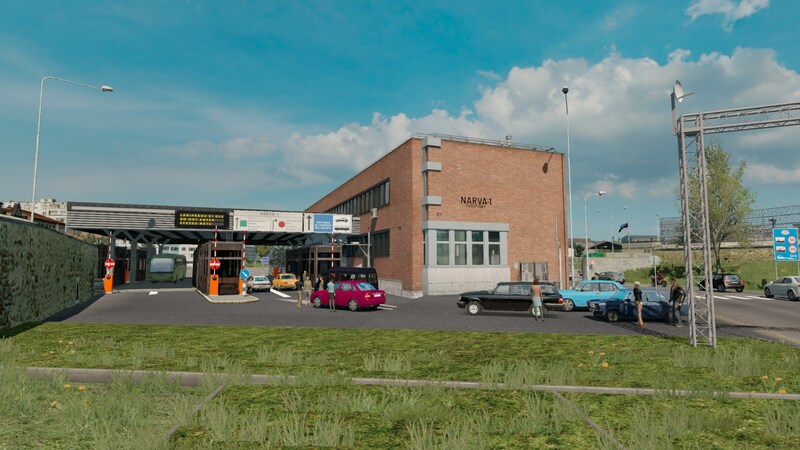 Added Narva 1 crossing point which was still under construction on PM version, but you still have to use the old one. 3. Border crossing is much more complicated and slower now. 4. Many realistic or more-less signs have been added. 5. 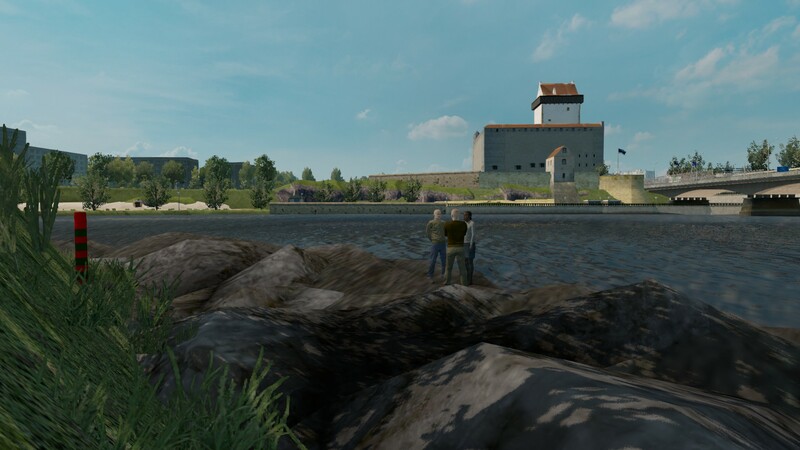 River promenade has been added to the both Narva and Ivangorod. 6. The whole town of Ivangorod was rebuilt according to aerial image, drone footage, real life photos and YT videos. 7. Many landmarks have been added, atought to see some of them you need to use the free camera. 8. Some cosmetic changes around the city of Saint-Petersburg. 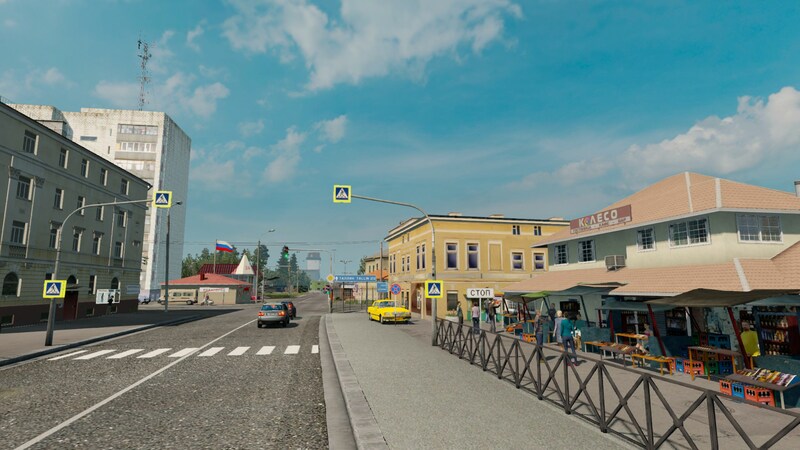 BONUS for realistic Russian highways version only: Many misspelt signs have been corrected, missing poles have been added, some other bug fixes around the city of Saint-Petersburg. The mod comes in two versions. For vanila RusMap (currently still in WIP) and brainiac's realistic russian highways mod (currenltly in BETA with some changes to be done). Pros and cons of using the vanila RusMap version. Updated to 2.1. -You will get all the new RusMap improvements inculding the new rebuild Saint-Petersburg. -Stable from bugs and errors. -The road network is less realistic and interesting to explore. Pros and cons of using the realistic russian highways version Currenly in BETA. -You will got a whole new complicated road network with lot's of up-to-date signs and highways. -You will lose lot's of areas improved by the new RusMap update, including the centre of Saint-Petersburg. -There are still many bugs left around:: misspelt signs, stamped water, floating scenery objects etc. -The city centre of Saint-Petersburg is not fully reworked. I removed extra companies from the city centre, but now there is an empty area which I didn't rebuild yet. -You will have a shifted world map. Ivangorod mod for the realistic Russian highways version. BETA. Place it above all map mods. Need the realistic russian highways by brainiac to work. BETA1. Needs RusMap 1.8.1 and ProMods 2.30 to work. Needs RusMap 1.8.1 and ProMods 2.30 to work. Version 2.1 for vanila RusMap. To be used with 1.31. Version 2.1 for vanila RusMap. To be used with 1.32. Version 2.2 for vanila RusMap. To be used with 1.31. Version 2.2 for vanila RusMap. To be used with 1.32. ProMods 2.30 Legacy Compatibility Fix is VITAL to run the vanila RusMap version. Place Ivangorod map above all map mods but below the Legacy Fix. Last edited by Maxest on 29 Oct 2018 12:57, edited 24 times in total. I don't see download link. I have been uploaded it with Google Drive and maked the link public. Maybe it's not showing up in the all of browsers? I also only see the Realistic Russion Highways version. Because it's the only one available by now. I'm still working on that version, and bug fixes for the r.r.hw. version. Pros and cons of using the vanila RusMap version. Currenly not available!. Looking forward to trying out your mod when you release a vanilla RusMap version! Oh! That's a very strong con. Well realistic russian highways is a great mod, it's only one serious problem is lot's of bugs that can ruin the feeling. But I suppose the stable version for vanila RusMap will be available much more sooner - because most of the fixes are already in, so I need to find and fix only my own mistakes. Which is way more quicker job. I still don't see link. On bottom on 1. post I see empty space. I guess that there is link, but I don't see anything.